A Supreme Court attorney with extensive experience in both legal practise and academia in North America, Hong Kong, Australia and the Middle-East. 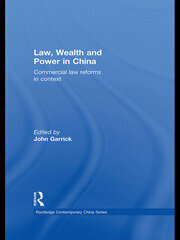 Recent books include Law, Wealth and Power in China (paperback direct 2014) and Law and Policy for China's Market Socialism (paperback direct 2015). Forthcoming: 'China's Socialist Rule of Law Reforms Under Xi Jinping' (with Yan Chang Bennett). John Garrick is a practising solicitor of the Supreme Court of New South Wales and former judge’s associate of the Supreme Court. Until 2006 he was in private legal practice with the major Sydney firm Ebsworth & Ebsworth, Lawyers, specialising in commercial law. He is currently convenor of post-graduate Competition and Consumer Law at Macquarie University (Sydney) and is author and co-editor of a wide range of scholarly publications including Law, Wealth & Power in China: Commercial Law Reforms in Context (2011); Law and Policy for China’s Market Socialism (2012) and several well-known Routledge books on power relations. He has worked extensively in both legal practice and academia in Hong Kong & China, the Middle-East, North America and Australia. International comparative law; Chinese commercial law reforms in the context of market socialism; directions in the deepening of socialist rule of law in China and implications for international legal systems. In addition to global rule of law developments, personal interests include philosophy and sociology. For example, competing conceptions of what constitutes 'valid' knowledge, theories of learning in the context of work and ethical social models for development.